This is categorized under spa for the studio lot! It's perfect for a burnt out movie star. This gently maxes out your motives and needs. It should work with or without any expansion pack. This chair is setting new Utopian standards. The egg shape of the chair is perfect for mind altering energy waves on the head. The brain controls the body. And when the brain is happy, the body is happy. Says Upper Mind delegate Josh Matthouse, "We have been seeing many mood enhancers recently, but this one seems to be the best balanced. It has a gentle affect on the sim sitting in it, and you get your money's worth. It doesn't interfere with the pulse of the lot as much as other brands. Every office should have one." 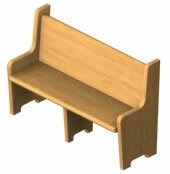 There are actually 4 pews in this object file. Two wood and two white. Two with a length of three tiles and two with a length of two tiles. Are your sermons bombastic and boring? Unequivocally uninspired? Downright dull? Then we have the solution for you! The WakeWonder 4000-series pews have been proven in double-blind clinical studies to keep bored laity 20% more alert than our closest competitor! 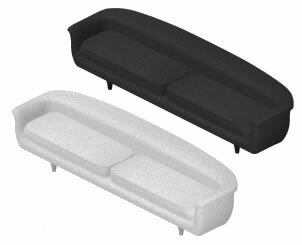 Features include narrow benching (to keep them on the edges of their seats), hardened backrests, and strategic splintering. There is nothing like a set of hard, uncomfortable chairs to really stretch out a meal or ceremony. Make your thirty-minute event seem to last all day with a set of these affordable folding chairs! Our auditorium seating makes even a lecture on the Future of Bass Fishing endurable, thanks to the comfort and quality found in every Frontro seat. Remember, if you got a good seat, you're sitting in the Frontro! Both chairs are included in this download. A replica of an actual chair used in a saloon in a wild town of the West, this chair is a museum of thoughts and events. Every scratch is carefully modeled after the original as to keep the character of the Old West. This chair changes colors when a sim sits in it. It's the awesome, amazing, color-changing, psychedelic chair. Color changing macro-pigments allow ten different colors to be displayed. Pressure sensitive padding activates the macro-pigments into a state of excelled activity. Buy it today for great fun. Both the chair and sofa are included in this download. Sitting is believing! And you won't believe the amount of comfort Air Head sofas and chairs deliver! Now FOUR OUTRAGEOUS colors! 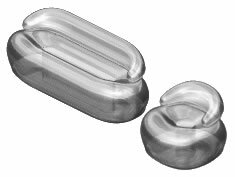 Using patented air-capture technology, Air Head is able to create buoyant gas cushions capable of supporting both the thinnest and thickest of posteriors. Transparent furnishings for transparent people...come be a "gas bag" right now! Both sofas are included in this download. Only the highest quality fabrics go into regal sofas. Professional, above standard, classy, stylish; these sofas are nothing to sneeze at! There is nothing like the barrel seat. Bare wood makes the best seat!